Professor Graham Matthews visited Cameroon in 2017 on behalf of ACTIS to develop an update on what was being done to alleviate the biting of blackflies – a major constraint to productivity. 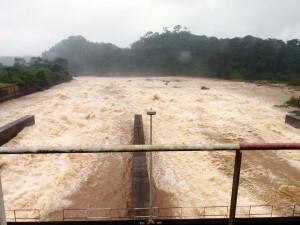 The photo is of the outflow from the Songloulou Dam, showing the enormous volume of turbulent, oxygenated water, ideal for development of Simulium blackfly larvae. Engineering solutions would be a more efficient approach than curative actions later.